THE Malaysian Investment Development Authority (Mida), an agency under the International Trade and Industry Ministry (Miti) that promotes investment in the manufacturing and services sector in Malaysia, is urging more industry players to collaborate with local universities to boost the country’s talent. Its chief executive officer, Datuk Azman Mahmud, said Mida is pleased that more corporations are responding positively to its call in closing the gap between the latest industrial know-how and university syllabus. He highlighted the country’s adoption of Industry 4.0 as the future direction. “We encourage companies to invest in talent and technology to improve productivity and their capabilities to become future-proof. Azman was speaking at an event to mark the collaboration between German-based Muhlbauer Group and four local higher learning institutions at Mida headquarters in Kuala Lumpur. Muhlbauer Group, which produces high-tech equipment and automatic solutions for the semiconductor back-end industry, is donating RM200,000 worth of automation integrated systems, known as Beckhoff mock-up units, from its Melaka factory to Universiti Malaysia Pahang (UMP), Universiti Teknikal Malaysia Melaka (UTeM), Universiti Tun Hussein Onn Malaysia (UTHM) and the German-Malaysian Institute (GMI). In addition, all four higher learning institutions will be getting approximately 40 hours of training as well as support expansion of the equipment, which includes image-processing technology. With more than 2,000 employees worldwide and technology centres in Germany, Malaysia, the United States and Slovakia, the Muhlbauer Group produces innovative systems and software solutions for the production and personalisation of identity cards, passports and RFID applications. “This initiative will contribute in many ways, especially in enabling lecturers and students to be familiar with the latest technologies in the industry. 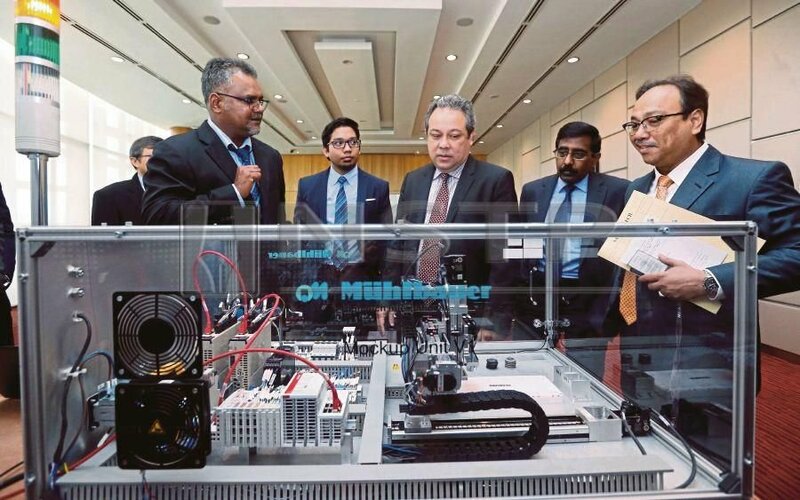 “It will also provide hands-on experience for students in mechatronics engineering or those interested in joining the high-tech industry relating to mechanical, electrical and electronics, programming and vision technologies,” said Azman. Muhlbauer Technologies Sdn Bhd CEO Sekar Ramasamy said the company has been supporting local communities through collaborations with universities, colleges and other learning institutes. “By enhancing practical education at universities, we want to lift this partnership to the next level and help students prepare for the challenges of digitalisation and Industry 4.0,” he said. UTeM, represented by its Industrial Liaison Centre director Associate Professor Dr Kok Swee Leong, regards the donation as an expansion of its relationship with Muhlbauer Group. “We have been collaborating with Muhlbauer since the setting up of its Melaka centre in 2007. It is hoped that this donation can take the knowledge-sharing and talent development efforts to the next level,” he said. UMP Faculty of Mechanical Engineering dean Professor Dr Rizalman Mamat said some of his students are already studying mechatronics and engineering in double degree courses involving German universities. Associate Professor Dr Rosli Omar, dean of UTHM Faculty of Electrical and Electronic Engineering, said his students will greatly benefit from the latest updates and skills transfer from Muhlbauer. GMI deputy managing director of education and training, Ngan Cheng Hwa, said the institution has a few systems that it is using to teach its students. “This donation from Muhlbauer will create a greater diversity of equipment and technology at GMI,” he said.